In 2017, MSF continued to provide treatment for HIV, tuberculosis (TB), non-communicable diseases (NCDs) and mental health issues. Poverty and unemployment are endemic and political strife and repression are commonplace in Zimbabwe. The landlocked country of over 16 million people was led for over 35 years until 2017 by President Robert Mugabe, the pro-independence campaigner who wrested control from a small white community and became the country's first black leader. Zimbabwe has one of the highest HIV prevalence rates in the world. However, access to treatment has improved in recent years. Médecins Sans Frontières (MSF) has worked in the country since 2000, providing wide-ranging HIV/AIDS and tuberculosis (TB) care. The health sector in Zimbabwe faces numerous challenges, including shortages of medical supplies and essential medicines. MSF continued to run water, sanitation and hygiene projects, provide cervical cancer screening and treatment, care for victims of sexual violence, and respond to emergencies. 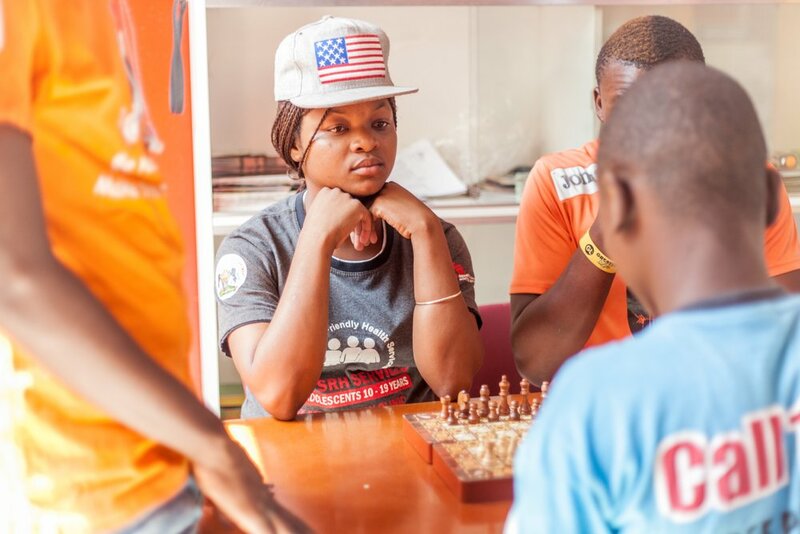 MSF offered treatment and psychosocial support to 1,356 victims of sexual violence and comprehensive youth-friendly sexual and reproductive health services to 2,454 adolescents in Mbare. MSF improved the provision of clean water to vulnerable communities in Harare by rehabilitating and upgrading 13 boreholes and drilling five new ones. The team also supported the response to an outbreak of typhoid in Harare. In Manicaland province, MSF supported the scale-up of viral load testing in 40 health facilities and the management of patients whose antiretroviral therapy had failed. Staff also assisted with the treatment of NCDs such as asthma, hypertension and diabetes, and piloted the integration of treatment for HIV-positive patients living with NCDs. A total of 1,861 patients were followed up for NCDs in Chipinge and 550 diabetics were registered for treatment in Mutare. In addition, MSF is supporting a pilot programme of nine-month treatment for patients with drug-resistant TB. At the end of 2017, three patients had been initiated on this treatment. MSF continued to run HIV outreach programmes using patient-friendly, empowering models of care for hard-to-reach communities whose nearest health facilities can be up to 180 kilometres away. 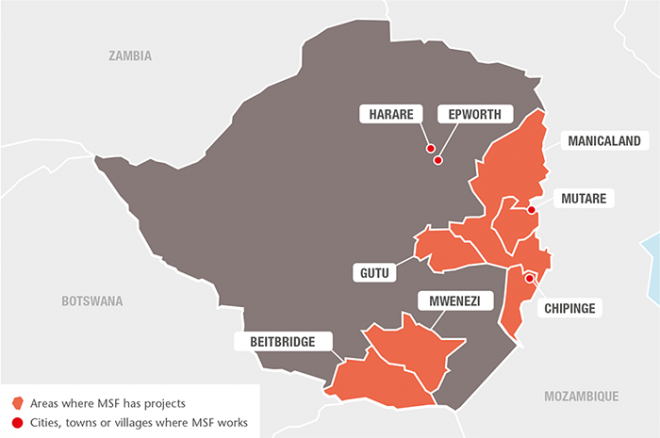 MSF supported the health ministry to provide cervical cancer screening and treat patients with early-stage cervical cancer in Epworth and Gutu. A total of 5,925 women were screened for cervical cancer and 597 received treatment. Mbare Polyclinic Adolescent corner creates a conducive environment for conversations regarding sexual and reproductive health. In collaboration with the health ministry and the World Health Organization (WHO), MSF offered WHO Mental Health Gap Action Programme training to around 250 nurses from various health institutions. MSF also provided coaching and mentoring services to the Ministry of Health and Child Care, Zimbabwe Prisons and Correctional Services and City of Harare health staff in preparation for the handover of MSF's mental health projects at Chikurubi maximum security prison and Harare central hospital at the end of the year. In five years, MSF teams had cared for 4,250 people in the psychiatric unit. MSF’s Harare community psychiatry intervention was handed over to the University of Zimbabwe in October. 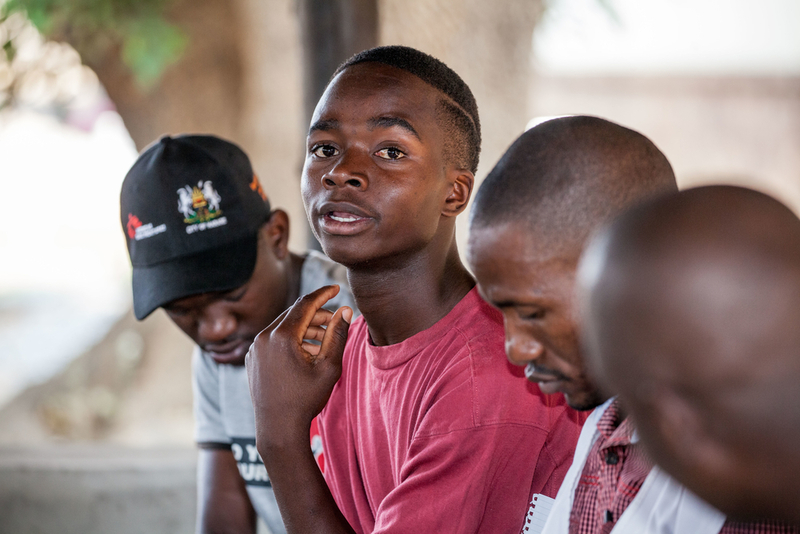 MSF teams also provided training on advanced HIV/TB, DR-TB and paediatric and adolescent care for newly recruited doctors at Epworth clinic, and on treatment for victims of sexual violence for nurses in Harare polyclinics. After 11 years of offering treatment, care and support to more than 24,406 HIV patients and 9,197 TB patients, MSF handed over the Epworth HIV/TB project to the health ministry at the end of 2017. Although MSF handed over its viral load monitoring activities at the national microbiology reference laboratory and Beatrice Road infectious diseases hospital, the team continued to support the implementation of viral load monitoring in its projects. Joel* was working as a cleaner at a company in Harare when he suddenly became very violent at work. He was taken to hospital and admitted to the psychiatric unit for treatment.